If Cinderella was looking for her glass slipper, she might visit the Museum of Glass in Tacoma, a serendipitous cultural establishment about 30 miles from Seattle that was home to a wedding full of space, light and warmth. Museum of Glass wedding photography offers the natural advantage of one-of-a-kind photo options in a storybook setting. The wedding party prepared for the grand day at the Courtyard Tacoma Downtown, also home to light, space and wonder and another remarkable spot for wedding photographs. The stylish groomed donned a white tuxedo jacket and the brides and bridesmaids emphasized their wedding-day beauty with soft pink and soft smiles. Together, we explored the Old City Hall Historic District, dotted with interesting textures, good light and some distinctive wedding photo opportunities. After a very romantic image taken on the Spanish Steps, this graffiti-toned image seemed to perfectly embody the gritty side of Tacoma, and the bride and groom welcomed the chance to record their day with a variety of scenes, sights and silhouettes. 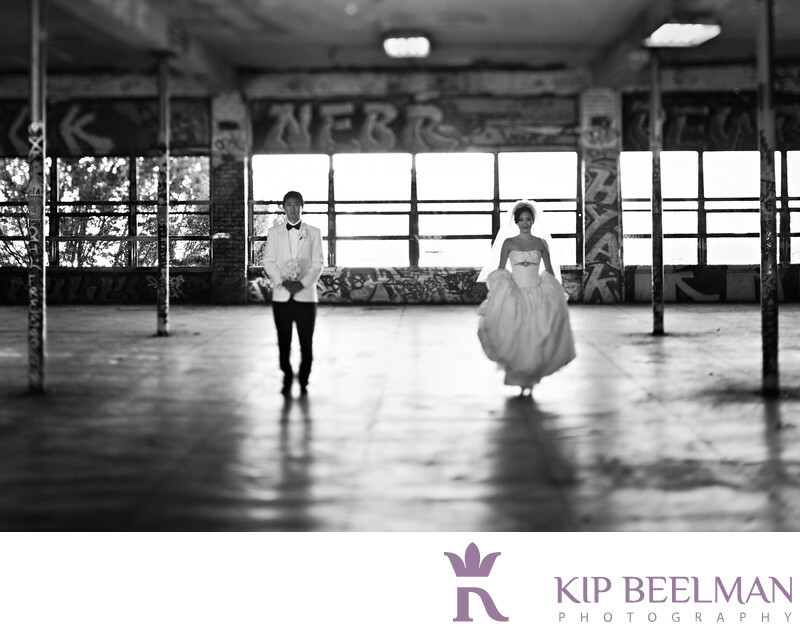 We all enjoyed the contrast between the couple’s elegant look and attire and the raw warehouse feel of the space. Just prior to the ceremony at the Museum of Glass, we took additional portraits on the bridge of glass, where the couple peered joyfully into the future. The wedding ceremony and wedding photographs took place on the Museum of Glass’ outdoor sculpture plaza at sunset, a dynamic setting suffused with creativity, light and wonder, adjacent to the Museum’s reflecting pools offer stunning views of artwork, the Thea Foss Waterway and the cityscape. The Museum of Glass was created to honor the role the Pacific Northwest played in the studio glass movement around the world, which coincided with the redevelopment of the Thea Foss Waterway. Today it is one of the most beautiful institutions in the world and now home to one of the more beautiful events I’ve enjoyed photographing. The evening finished with a lovely reception inside the museum, making for a very stylish, very creative and very memorable wedding. Location: 1801 Dock St, Tacoma, WA 98402. Keywords: Indoor Wedding (6), Museum of Glass (3), Tacoma (3), Washington (15).